THE new Conservative government is planning a major shake-up of the Scotland Office and is open to proposals for more devolution, it emerged yesterday. A senior source within the party said that the Prime Minister David Cameron “understands the need for a change of approach to Scotland”. Cameron, who is taking the weekend to finalise his cabinet reshuffle, is expected to appoint David Mundell, the Conservatives’ only MP north of the Border, as Scottish secretary. Mundell, who has had to cancel his planned holiday to Florida after managing to survive the SNP surge, is frontrunner for the job. 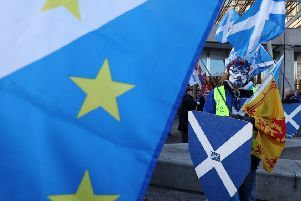 As a minister for state in the department, senior sources have said that he “impressed” the party leadership with his work on devolving more ­powers to Scotland and the referendum. However, other names have been mentioned, including Scottish born Welsh Secretary Stephen Crabb, who has just masterminded an election campaign in Wales which saw the party increase its seats from eight to 11. Crabb, who could lead a constitutional review of the UK, has also been mentioned as a future party leader, ­including at a recent Welsh ­reception by Cameron. With the SNP winning 56 out of 59 Scottish seats it is also understood that Cameron will soon hold talks with First Minister Nicola Sturgeon. London mayor Boris Johnson, who was returned to Westminster as MP for Uxbridge, has led calls among senior figures for a “more federal UK” and a “rethink on Scotland”. It is understood that the government is considering a constitutional convention for the UK, although it will keep its promise to bring in a bill in the first Queen’s speech to devolve the powers agreed across parties in the Smith Commission. The new Tory government will also move quickly with its plans to bring in English votes for English laws to lock Scottish MPs out of English-only matters, including some parts of the Budget when income tax and other taxes are devolved to Holyrood. He added: “I was pleased our vote held up in Scotland and we were very unlucky not to win a second seat.